So today was the first day sense coming to Davis (no including days i went back to Chico) that I was in town and did not ride my bike. I woke up late and fiddled around on the internet for an hour or so and then took a nap for three hours at this point my Dad came into to town to visit me and we went around Davis, stopping at the Sudwerks for dinner and then we went to see The Simpsons Movie. Which was good, not a real deep or throughly dramatic movie but funny, it was everything you would expect from The Simpsons. Today I also bought a 750ml bottle of 12 year blended Jameson Irish Whiskey, I had a taste of it and it is very smooth, I am most delighted with it. I expect it to last for some time as I have just a plain bottle of Jameson for making Irish car bombs and Johnny Jump Ups. I also have a bottle of Crown Royal and Kirkland Signature Vodka (distilled in France) which I plan to use for cooking and in the case of the vodka drinking too. 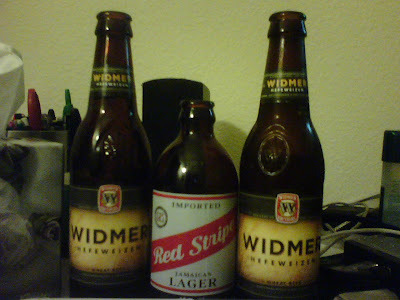 Tonights beers include Widmer Hefeweizen and Red Stripe Jamaican Lager.